Last year, Natalya and I attended the Meatball Master Class at the De Gustibus Cooking School which was taught by Daniel Holzman of the The Meatball Shop. This refreshing Spring Pea and Cabbage Slaw was served with Mini Maryland Crabcake Balls, and it balanced the saltiness of the crabcakes quite well. Daniel recommended to use fresh English peas or sugar snap peas, although I had a bunch of canned sweet peas to use up… convenience wins! Daniel also suggested adding poached shrimp to the slaw for more seafoodiness. 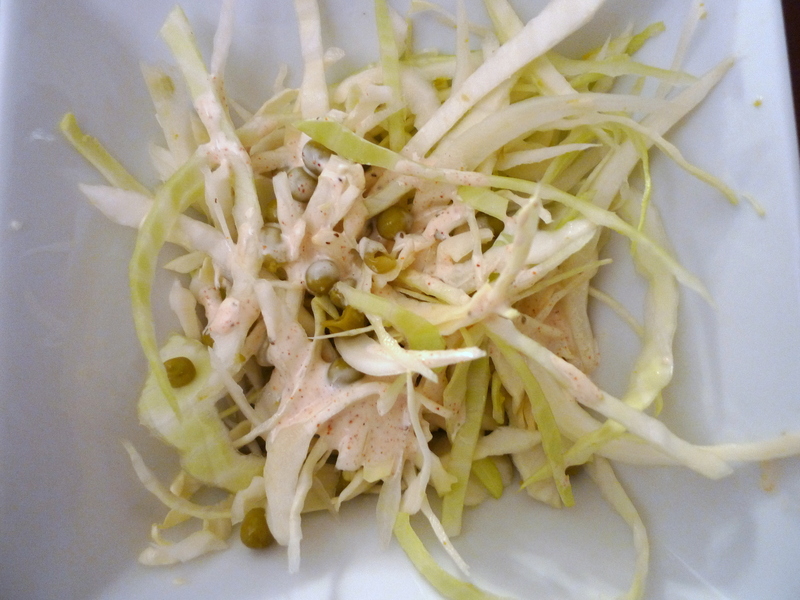 You should make this slaw earlier before the crabcakes as they should be refrigerated for at least 1 hour before serving. Whisk all the Old Bay Mayo ingredients together and season to taste with salt. Toss the cabbage, peas and Old Bay Mayo together, mixing thoroughly. Season with salt to taste and let sit 1 hour in a container with a tight fitting lid in the refrigerator for 1 hour before serving. Serve with Mini Maryland Crabcake Balls.